Water supply is a vital component of a farm and making sure systems are working efficiently can save water, time and money. The following tips will help identify opportunities to reduce water use and improve efficiency. Older poor quality water lines and connections are more likely to split and leak. Identify problem areas and mark locations of weak spots on a farm map. Gradually upgrade older sections to help prevent water loss. Replace ill-fitting connections to decrease the risk of leaks. Bring the problem areas to the attention of everyone working on the farm. Water lines that are near the surface, run under races or over drains are at particular risk of damage. Mark the locations of these weak spots on a map. Bury the lines deeper to protect them. If renewing or replacing lines, bury them alongside a fence to give added protection. To prevent problems where water lines must go under races, place them inside a larger rigid pipe for protection. Where lines cross drains, strap them securely to the bottom side of a pipe or post. Bring these water lines to the attention of everyone working on the farm. Having a check and maintenance system for water troughs that staff are familiar with is an important preventative measure for leaks. Use time bringing in the cows to look out for anything on the farm that might need attention, such as overflowing or empty water troughs. Tilting troughs slightly toward the race will make it easier to spot water loss on the drive by. Carrying spare parts and tools on the farm bike allows for the immediate repair of simple problems. Schedule in regular trough maintenance. Include replacing troublesome ballcocks and checking balls, strings, arms and pins. Have a system to record and sign off these checks. A farm map can be used to outline details of the water system, highlight areas prone to leaks and losses, identify where improvements could be made and where meters should be/are installed. Farm water maps are useful for relief milkers and staff so problems can be solved when you are off the farm. Tip: Include on your map an indication of what is a fix and what is to be replaced when it breaks down. This will help to spread the cost of upgrades over a manageable timeframe. It is estimated that 26% of stock drinking water is lost as leakage. This wastes valuable water, causes areas of mud and flooding and incurs extra pumping costs. Having leak detection systems in place and a process to deal with leaks helps to manage them and reduce these effects. Leaks can vary in the rate of water loss. Fast leaks are often noticed immediately and fixed quickly while small leaks can often go undetected for a long time. Early detection can prevent excessive water loss. A water meter with telemetry can alert you as soon as the leak occurs. If the leak is in the middle of the night, turn taps from the water tanks off and deal with the leak in the morning. For more information on setting up a leak detection system, click here. Slow, low rate leaks are often not detected for a long time because the water system can cope with the leak. They are often only detected when they become a major leak or in summer when green patches are noticed in brown paddocks. While they are slow leaks, the amount of water adds up over time. One of the best ways to detect slow leaks is to have a water meter, or a water meter with telemetry and a data logger. With a water meter, water use can be monitored when water should not be flowing e.g. at night when cows are not drinking. If water is flowing, then the dials should be turning slowly and it is likely there is a leak. Areas of the farm can then be turned off with isolation valves, to work out where the leaks are. When a data logger and telemetry is installed, finding slow leaks is much easier. Night time water use over a period of time can be monitored and if water use is higher than it should be, then it may be due to leaks. If houses are connected to the stock drinking water line they may use water at night. Areas of the farm that the cows are not in can be turned off with isolation valves over successive nights to work out where the leak is. The nightly recorded water use can be checked to see if the water use has decreased. Which staff member is responsible for water tasks? This will help to ensure things are done regularly and smart water use efforts run smoothly. What is the farm’s agreed yard wash-down method? Significant amounts of water can be saved (or wasted) on the farm depending on how yard wash-down is done. Train new staff on this and review it with workers each season. What is the procedure for dealing with leaks and losses? Write down the steps you want taken when there is suspected water loss to ensure staff have a consistent approach. You could use a board to note the status of the problem while it is being attended to and to sign-off completion. Some experienced farmers say if it isn’t written down it doesn’t happen. Efficient processes for milk cooling, vat wash and yard hosing can add up to significant savings in water. Find out about the most effective way to monitor water use and detect leaks. With growing demand, smart water use is now more important than ever. 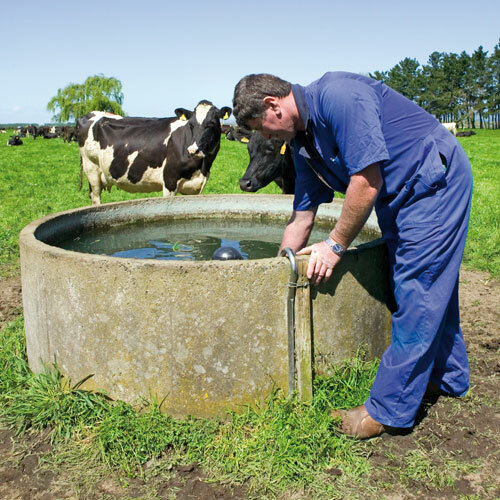 Find out the most efficient methods for water use on the farm and in the milking shed. This brochure provides a simple five-step approach to save water and save money.